Save 10% (up to $300) with the 2011 Federal Tax Credit for qualified Gas Tankless Water Heaters. At 199,000 maximum BTUs the Bosch 940 ES is our highest capacity non-condensing tankless water heater. The Bosch Therm 940 ES was designed to meet the demands of busy households and offers the premium features you expect from Bosch. This model can be installed almost anywhere thanks to its sealed combustion and dual-fan technology. It features an electronic ignition system and requires either 3 inch or 4 inch diameter stainless steel vent pipe and can be vented either through the side wall or up through the roof. This heater is Energy Star rated. This heater comes with built-in freeze protection and a water filter that is externally accessible, but does not come with a PRV. 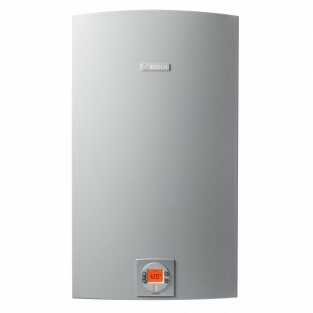 The Bosch Therm 940ES is the direct replacement for the Bosch GWH 715 ES and the Bosch AquaStar 2700ES. Bosch gas tankless water heaters, electric tankless water heaters, electric mini-tank water heaters and accessories are warranted directly by the Manufacturer (BOSCH) through Bosch Thermotechnology Corp. Please visit the Bosch-Climate.us web site Warranty Page for the full details of the Bosch product warranty. Be sure to fill out your Warranty Card and send it to Bosch immediately after your installation to ensure you are registered for the full product warranty.